The infection starts by an attempt to brute force SSH login credentials of the root user. 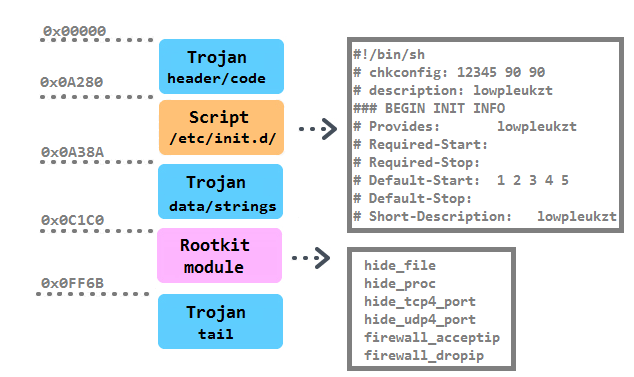 If successful, attackers gain access to the compromised machine, then install the Trojan usually via a shell script. The script contains procedures like main, check, compiler, uncompress, setup, generate, upload, checkbuild, etc. and variables like __host_32__, __host_64__, __kernel__, __remote__, etc. The main procedure decrypts and selects the C&C server based on the architecture of the system. In the requests below, iid parameter is the MD5 hash of the name of the kernel version. The script first lists all the modules running on the current system by the command lsmod. Then it takes the last one and extracts its name and the parameter vermagic. In one of our cases, the testing environment runs under “3.8.0-19-generic SMP mod_unload modversions 686 “, which has the MD5 hash equal to CE74BF62ACFE944B2167248DD0674977. The previous steps run only in the case that there already is a built version for the current kernel version on the server side. If not, the script locates the kernel headers in /lib/modules/%s/build/ directory, where %s means the return value after calling the command uname with parameter r, then packs all files and uploads them to the C&C server using a custom uploader called mini. The steps of the first scenario follows. The rootkit component is a loadable kernel module (LKM). To install it successfully on a system, the vermagic value of LKM needs to agree with the version of the kernel headers installed on the user’s system. That’s the motivation behind previous installation steps. If previous sequences fail, the script installs a Trojan omitting the rootkit component. The line “*/3 * * * * root /etc/cron.hourly/cron.sh” is inserted in the crontab. The lists of processes to kill or remove before its own installation is typical for flooding Trojans. A few days ago, a new 32-bit variant of this Trojan with few modifications was observed. The bot is installed as /lib/libgcc4.so file, the unique file containing its identification string (see later) was /var/run/udev.pid, the initialization script was /etc/cron.hourly/udev.sh and the rootkit features were completely omitted. The presence of all these files could serve as an indicator of compromise (IoC). Based on the procedure names, it is likely that the malware authors were inspired by the open source project called Suterusu to build up their rootkit. 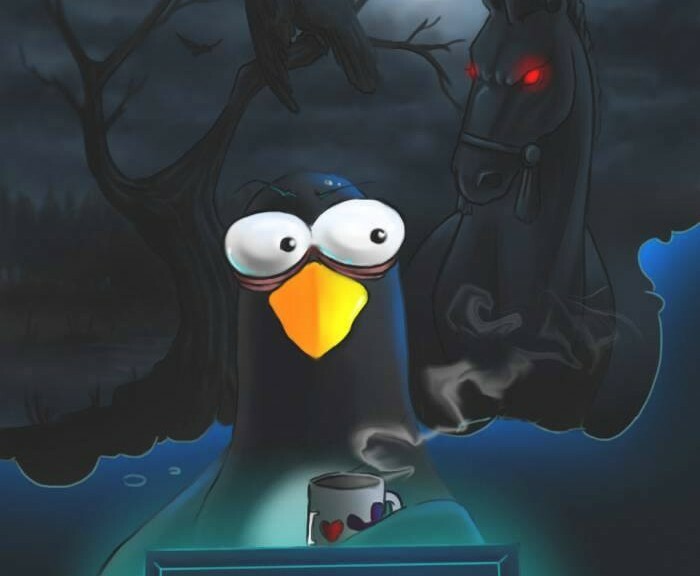 The Trojan from last year called Hand of Thief failed in its ambitions to be the first banking Trojan for Linux desktops. It also borrowed part of its code from an existing open source project, namely methods of process injection. 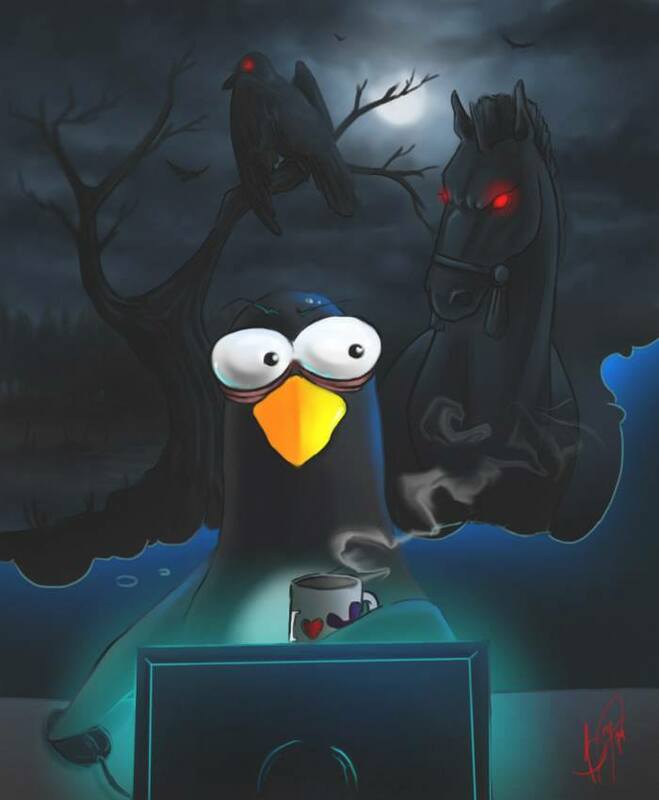 The description of the project says “An LKM rootkit targeting Linux 2.6/3.x on x86(_64), and ARM”. Another article related to Suterusu was published in January 2013. The rest of the flooding command contains an encrypted structure with attack tasks. After decryption, we can see an IP address (red color) and ports (green color) which will be flooded by the Trojan and other parameters of the DDoS attack (e.g. grey color decides the type of attack: SYN/DNS). Thanks to my colleague, Jaromír Hořejší, for cooperation on this analysis. Pop-art was created by the independent digital artist Veronika Begánová.